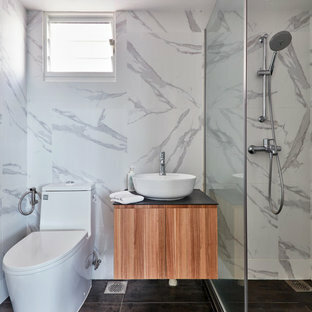 How Do I Use Houzz For Bathroom Inspiration Ideas? 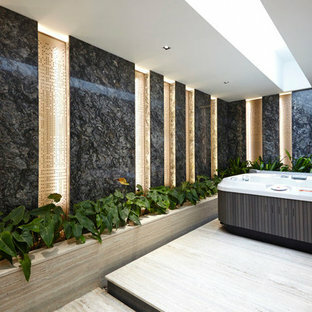 We Singaporeans shouldn't underestimate the importance of the bathroom in our daily lives! Consider the amount of time we spend at the beginning or end of each day here. Or even the physiological effect this space's functions and aesthetics has on our senses. You definitely wouldn't want to compromise on your bathroom renovation! 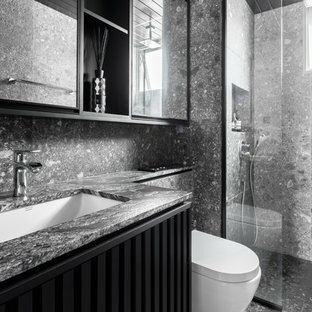 Which Search Terms Should I Use on Houzz To Find Inspirations for Bathroom Designs? 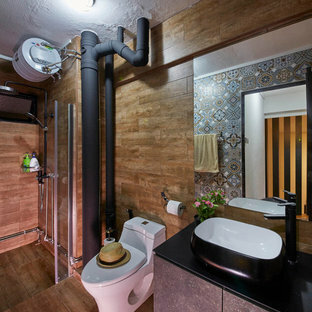 While some may term the general space where one takes a shower and use the toilet as a "bathroom", another might simply call it a "toilet". Similar variations occur with quite a few other terms we use for the functions within this space. 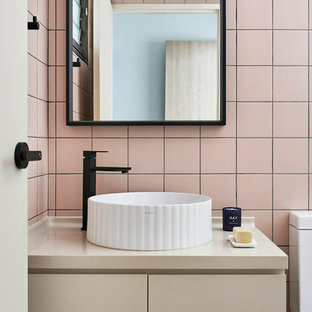 To make sure you find what you're looking for, here's a few points of clarification that you'll want to be aware of, especially if you're looking for small-space bathroom inspirations beyond Singapore! Throughout the entire English speaking world, describing the space that we use to clean ourselves can have multiple variations. A space that includes a shower and/or a bathtub, a toilet, and a sink, is generally understood as a full bathroom. Singaporeans may be used to the word "toilet", however, this should really only be used to describe the actual fixture within the bathroom space. The proper way we would ask "May I know where the bathroom is?" is just that, without mentioning "toilet". So unless you're looking for different designs, shapes and sizes of the toilet, you're better off using the word "bathroom" in your search for a modern, sleek looking -styled bathroom. 2. Bathroom Vanity or Sink Pedestal? What sets the bathroom vanity apart from the average bathroom sink pedestal is the former's incorporation of the bathroom sink on a surface (such as a countertop) which might incorporate various functions. (e.g. a cabinet for storage) Some Singaporeans also use the term "basin cabinet" for this functional object as well. Others would simply have a mirror cabinet for storage, along with the sink below. The term vanity can sometimes be confusing, as it describes both a dressing table, as well as the unit within the bathroom. 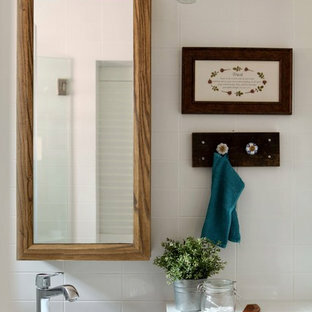 On Houzz, this is made clearer as there exists a "vanity" section under the Bathroom photos. 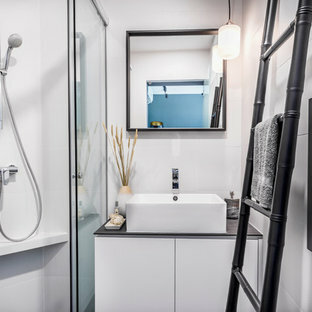 This one's a little more obvious - showers are more common in HDBs and condominium apartments due to space limitations and regulations. 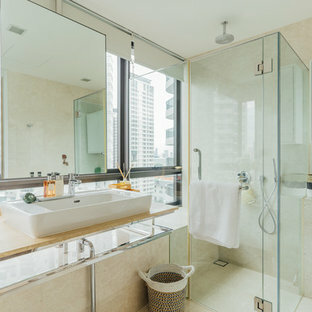 However, in some landed property and condominium bathrooms, showers might be incorporated into baths or bathtubs. You can search for these simply using the term "bathtub showers", then apply the "Singapore" location filter. 4. Bathroom Flooring or Bathroom Tiles? A search for "bathroom floor" gives greater search results if you're simply looking for flooring options for this space. Once you've understood what sort of flooring surface you want for your shower, use specific terms such as "ceramic tile" then subsequently narrowing the home space to "bathroom". Then adding the location filter "Singapore" if you'd like to narrow the results locally. How Do I Organise Inspiration on Houzz? With so much going on in the bathroom, you'll want to create a separate ideabook for each function, whether it's for the cabinet, vanity, sink, or mirror. You can also create ideabooks for your preferred bathroom: That will help define your preferences and help in your conversation with a professional as well. 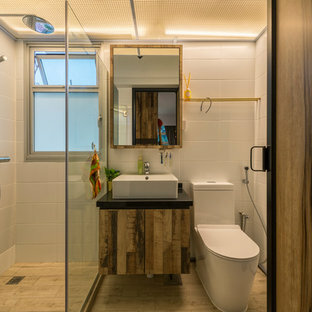 What Should I Do With My Bathroom Design Ideabooks? 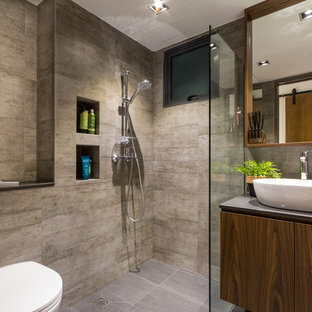 Your Houzz bathroom ideabooks can help refine your plan - whether your preferred choices can fit into your actual space. Having these ideabooks also mean that you're not leaving any choices to chance - decisions in such an important area for renovating should not be random. The mirror you choose should be one that you've considered fitting for your planned bathroom. If you're doing the renovation yourself, these choices will help move you towards checking through your floor plans and sketches. If you're hiring a professional (bathroom renovator, contractor, or interior designer), you'll be asking for quotes on the specific choices you've made in your ideabooks. The professional would also be able to give you help on issues regarding your bathroom design that you may not have considered. Whichever step you take, your bathroom ideabooks on Houzz will help give you direction towards realising your dream bathroom! Common Bathroom. The common bathroom has an array of wood finishes & embroidery accented tiles & some dark color pallet. The walls are in panels of wood finish material in medium shades of oak wood. The opposite wall is an embroidery like accent tiles in cool colors. The bathroom sink is a concave shaped with inner white porcelain, & a matte black exterior finish. The cabinetry has a grey concrete like texture finish with black counter top. Flooring in medium wood tiling. Bathroom (with Jacuzzi) feature wall: Metalicus Granite Floor: Travertine Unfilled, brushed All materials & photos by Polybuilding.